An exceptional way to be in touch with your family history is to visit locations important to your ancestors’ lives. July 2007 gave me an opportunity to do just that. The place was the Benjamin Church House, located since 1938 in Estabrook Park, Shorewood. The house was built about 1844 in an area then known as Kilbourntown. That name came from Bryon Kilbourn, land owner and founder about 1835 of the pioneer town just west of the Milwaukee River. Kilbourntown was one of three towns that merged in 1846 to create the city of Milwaukee, Wisconsin. The others were Juneautown east of the river and Walker’s Point to the south. In those days, the Church house was on Fourth Street at the intersection with Court Street, between Cherry and Galena streets. The site in the pioneer era is described as up a hill overlooking a tamarack swamp near the river. Benjamin Church, my ggg-grandfather, was one of the earliest settlers in Milwaukee. He arrived in November 1835 via Chicago from his birthplace in Ulster County, New York. 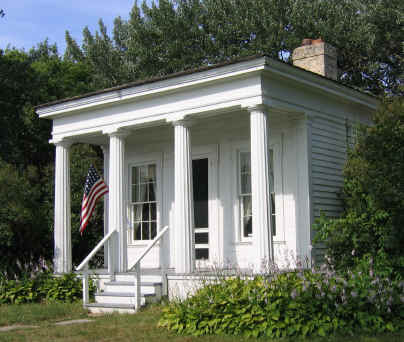 A pioneer carpenter and master builder, he brought the Greek Revival style from the East Coast to the young city of Milwaukee — and applied it to construction of his own family home. With its four graceful columns on the front and other distinctive features, the house gives the feeling of a small Greek temple. That Greek Revival style, combined with the use of hand-hewn lumber and Cream City bricks stamped with the date 1844 and initials of the brick maker, made the house worth saving, restoring and moving to a new location. The house today is an intimate museum of life in Milwaukee in the 1850s, with the furnishings giving a sense of what life was like in those days. Standing in the cozy house, I imagined Benjamin Church returning home, up the hill to the house, climbing the steps to the porch and enjoying the modest elegance of the Doric columns, then entering the house right into the small living room. A fire crackling in the fireplace and the sounds of his children would have greeted him at the end of a day’s work. His wife Permilia would likely have been in the kitchen cooking dinner, helped by oldest daughters Ann Maria and Ann Augusta. I imagine the younger children doing their chores, or their studies, or perhaps playing. Known to her family as Hannah, Ann Maria married Sherman A. Bradley on January 6, 1859. They too lived in the Church House and their son Jesse Charles Bradley was born there June 22, 1866. A special treasure awaited me in the back room of the house, where a display board told the history of house and of Benjamin Church himself. There on display was his photograph! See it on the page with his biography. The Benjamin Church House, also called the Kilbourntown House, is open to the public free during the summer. A docent or guide is on hand to talk about the house, its history and its significance in conveying a vivid snapshot of early Milwaukee history. Check with the Milwaukee County Historical Society for the hours the house is open. It is worth a visit! Essay and photograph by Barbara Ann Bradley Petura, July/August 2007.